Urethane Round Head Dumbbells, Set of 5-50 lb. Home » Sports Performance & Fitness » Strength » Bells » Dumbbells » Urethane Round Head Dumbbells, Set of 5-50 lb. Dumbbells are also available in individual fixed weight pairs. Can't find the set or increment you are looking for? Just give us a call at 1-800-966-7758 or send us an email, and we'll put together a quote for you. These urethane dumbbells have a solid steel design which offers one of the most compact dumbbells in the industry. The 32 mm handles are a hard chrome finish which will not flake or peel and the urethane is odor-free and will protect floors and equipment. Solid steel handles are press fit completely through the steel slug and then welded on the outside to provide a totally maintenance free dumbbell. 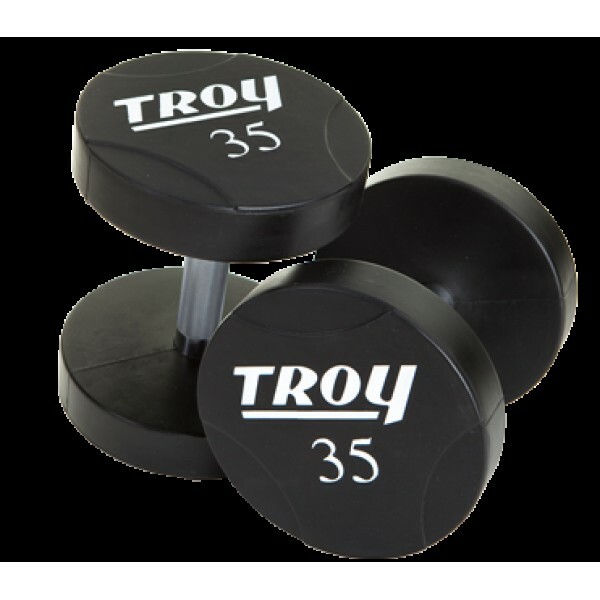 We carry a wide variety of dumbbells from the highest quality TROY pro style dumbbells to the basic cast hex dumbbell, all built with the user in mind. We have fully commercial dumbbells such as our TROY pro style series, TROY urethane encased solid dumbbells and our TROY 12 sided rubber encased dumbbells which will stand up to the most strenuous of workouts. We also carry dumbbells for the home such as our basic cast hex dumbbell, VTX 12 sided cast dumbbell and our VTX rubber encased dumbbell. As you can see, we have a dumbbell for any application.